Nose: Honey snaps (biscuits), malt, vegetal peat, wet leather, and something strangely like jalapenos and over-ripe green grapes. Sweet yet also tangy at the same time. Also some floral notes hovering around the back, and a faint traces of vanilla pods and fresh cut grass. Palate: Creamed honey, vanilla, and a strange mixture of something florally and briny vegetal-peat notes. Super sweet, yet also quite peppery. There’s also some pear cider and lemon zest floating around, and some candied ginger – and just a touch of Kakadu plum. Mouthfeel: Mid-heavy weight, and very slightly both oily and syrupy. A bit of alcohol warmth, but not a lot considering the ABV. Finish: Mid length. Fruity and vanilla, with slight sweet peat notes. Still a little bit peppery. Balance: An unusual whisky, and probably not for everyone. It’s definitely not the most well-balanced of Octomore releases, with the various profiles of the whisky never seeming to quite gel together. Named after the ancient Greek god of excess and festivity, and more particularly John Milton’s work, Comus, written in 1634. Octomore 4.2 is one of only two Octomore releases to actually have a name – the other being Octomore 2.2, Orpheus. In Milton’s play, Comus desperately tries to seduce an innocent girl with his ‘magic potions’, to ‘rob her of her virginity’ – a battle between sensual pleasure and physical abandon. 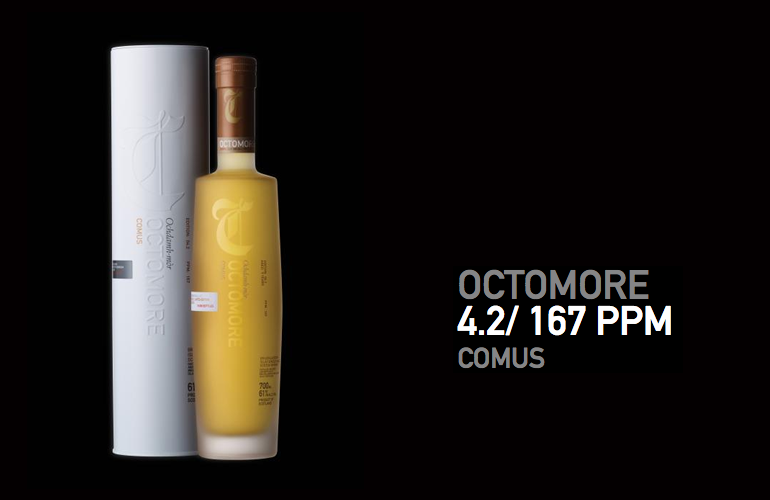 Octomore 4.2 was the most highly peated whisky available when it was released, equalled only by it’s brethren – Octomore 4.1, and was peated to 167ppm. This whisky was bottled at 61% after being aged for 5 years, and finished in Chateau d’Yquem Sauternes casks – only the second Octomore release to have been finished, after the Octomore 2.2. Unusually for an Octomore release, Comus was released in a frosted-clear bottle, and packaged in a shiny white tube rather than the normal matte black bottle and shiny black tube. The bottle and packaging is almost identical to that later used by the Islay Barley Octomores, the 6.3 and 7.3 releases. According to Bruichladdich, the packaging represented the innocent heroine in Milton’s play. Octomore 4.2 is a bit of an odd beast. Most Octomore releases I can tell you how much I like them at any particular time; Comus on the other hand seem to swing wildly – sometimes I love it, and at other times I’d barely rate it. I don’t know whether it’s my mood, or the weather, or what I’ve eaten; but it definitely bounces around my personal rankings like a yoyo despite the fact that I’m normally drinking it poured out of my bottle at home. It’s always a well structured whisky with some decent heft in the mouthfeel – so it’s definitely me being subjective. This is an unusual whisky, but one that I’d definitely recommend that fans of Octomore have a dram of should they happen across a bottle. I’d probably also recommend that anyone who comes across a bottle to have a dram of it, but wouldn’t urge anyone other than collectors to hunt down a bottle of it.